Donald Sobol is known to most people as the author of the popular Encyclopedia Brown series, of which there are more than 25 titles. What I didn’t realize is that Sobol actually wrote 65 books in all, and that some of them are about girls. Angie’s First Case, which was published in 1981, is the story of a 12-year-old girl who lost her parents at a young age. She and her older sister, Kit, live with their aunt, who doesn’t have much money, so Kit has given up the idea of college to become a police officer. Kit loves her work, but Angie is convinced that her sister could get promoted and be even happier if Angie helps her crack a major case. Every day, Angie goes out jogging in the hopes of catching a band of teen thieves known as the Wolfpack. One day, while she is out with Jess, a chubby boy she likes, Angie sees a series of suspicious events. By witnessing these strange occurrences, Angie sets herself up to become a kidnapping victim as well as a hero. This book is unlike any other middle grade mystery novel I have ever read. It is mainly plot-driven, like the Encyclopedia Brown mysteries, but the characters are strongly developed in the first couple of chapters so that the reader roots for their success as much as for the downfall of the bad guys. There is a hint of romance between Angie and Jess, but it is restricted to holding hands, which is very sweet and keeps the love angle from taking over the action and adventure that is the true focus of the story. The absence of all the technologies we use today requires Angie to rely on her wits to solve the mystery, which always makes a tale like this more exciting. There were a couple of points where I found myself thinking how much easier things would be if the kids did have phones, but I liked the added challenges and the ingenious plans the kids enact to overcome them. Though Sobol is great at delivering clues and other case-related information in a straightforward manner, he also has some great descriptions that evoke Angie’s emotions and thoughts at certain points in the story. One of my favorites is this moment, where Angie watches Kit put her gun away at the end of the work day. …[Kit] folded the ten-pound gun belt with its holster, gun, and two pouches of ammunition. The black patent leather gleamed in a ray of evening sunlight. Angie sat stiffly. The handgun fascinated her. It was .38, fast-loading, six-shot pistol with a dark wood panel inlaid on each side of the handle. Now it rested snugly in the holster. Yet its deadliness worked eerily on Angie’s mind. The gun seemed much larger than its actual size. She was amazed when it disappeared into the dresser drawer so easily. This passage conveys the power of the gun, Kit’s carefulness with it, and Angie’s sense of awe surrounding the gun and her sister’s important job. I love Aunt Velma peeking out at the girls from the living room, and Angie’s completely 80s hair and outfit. I also think it’s sweet that Kit is leaning down to kiss her sister. This illustration is by Gail Owens, who also illustrated some of the the Encyclopedia Brown books and other books by well-known 80s children’s authors like Johanna Hurwitz, Phyllis Reynolds Naylor, and Caroline Cooney. Owens was also the illustrator of The Cybil War by Betsy Byars. I was really impressed by this book and I wonder why Sobol never returned to Angie’s life to tell us of her future cases. 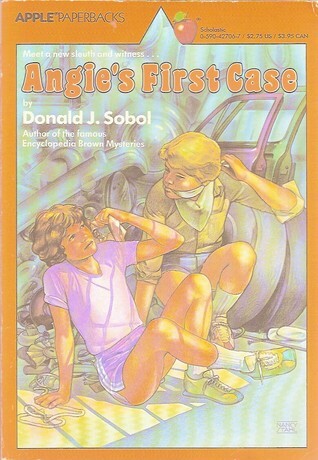 It seems like he focused almost exclusively on Encyclopedia Brown in the later years of his career, which makes sense, since they were so popular, but I fell in love with Angie in this book, and I wish there were more mysteries featuring her! Angie’s First Case is out of print, but copies abound on Amazon. Personally, I think it’s as relevant now as the Encyclopedia Brown books and would love to see it become widely available once again! I love Angie's First Case - I'm a big fan of Sobol's other stand-alones too, especially Secret Agents Four. It's hilarious! If you like Angie, have you ever read Astrid Lindgren's Bill Bergson mysteries? I recommend them.